CoinBuzz.club is malicious scam operation created by deceptive con-artists! Due to cleverly portraying their operation as a reliable Forex and cryptocurrency exchange, this sizable scam operation has been able to operate under the radar while growing in volume. Providing an inconspicuous and simplistic interface, CoinBuzz appears, at first glance, as a trustworthy destination for prospective Bitcoin investors. Fortunately for us, exhaustive research will suggest otherwise. As you will learn throughout this comprehensive review, CoinBuzz is a wide-scale scam operation, created by conniving thieves. Make sure to properly equip yourself as we investigate through the turbulent depths of this seemingly endless scam network. CoinBuzz tries to pull off the persona of an investment exchange site, when in reality their operation can most aptly be defined as a HYIP. As with most shady HYIP sites that we encounter, more emphasis is placed upon the affiliate tier than the actual investor program. This deliberate marketing tactic is employed to ensure that the site can receive as many new investors as possible. Getting started through their site is simple and based upon the illusionary perception that if you deposit a flat sum of bitcoins through their site, that you will receive daily returns for a fixed period of time. Almost unsurprisingly, this site promises to accrue an absurd minimum return between 140% to 210% within a 35 day period. Who is Responsible for CoinBuzz? CoinBuzz.club is allegedly owned and operated by a private limited company known as Bitstorm Limited. Registered under company number 10286668, Bitstorm Limited was incorporated on July 19th, 2016 and is filed under the registered office address 39 Cheyne Court, London, United Kingdom, SW3 5TR – which happens to match the alleged address of CoinBuzz. A Companies House search will reveal though that the current company status is Active proposal to strike off, which means that unless the operator pays the corporate dues owed their business will be liquidated and strike offed the register. Tim Waters, a British citizen born in April 1979, is the currently director behind Bitstorm Limited and also happens to be the alleged CEO behind CoinBuzz. Three separate investment plans are made available through CoinBuzz. Although these investment plans are represented in a fiat currency format, it should be noted that only Bitcoin deposits of equal value are accepted when registering for an account through coinbuzz.club. CoinBuzz is an immense scam operation that is connected with several other cryptocurrency related ventures. 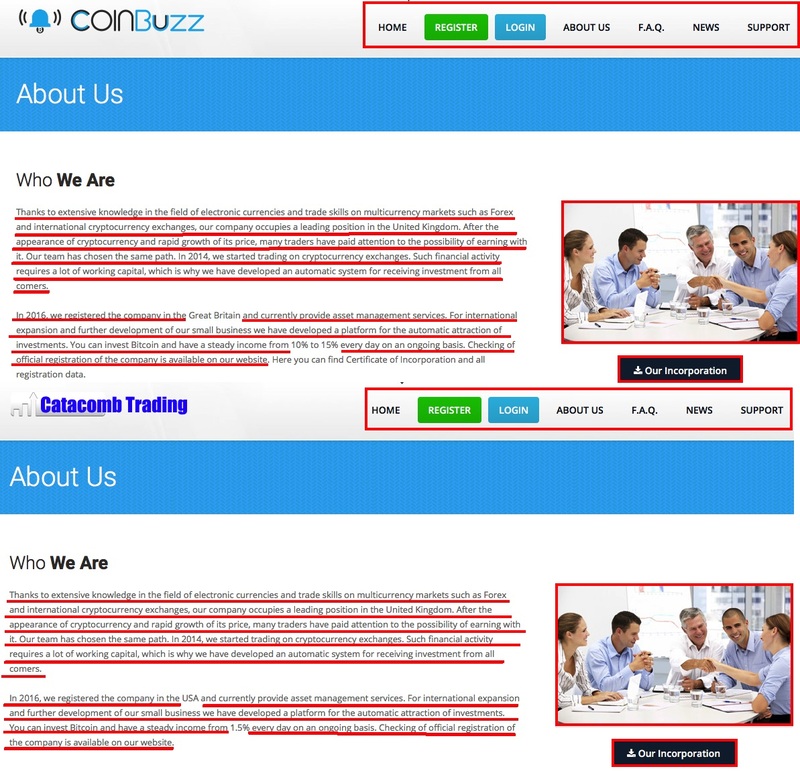 The further we dug in our investigate process, the more we discovered about the sinister nature of CoinBuzz. Throughout our research, we found that this operation is connected with 10 separate cryptocurrency schemes that all fit the bill as HYIP, Ponzi schemes and fraudulent operations. Fortunately, the creators behind these deceptive cryptocurrency sites were exceptionally lazy. Resorting to elementary levels of “copy and pasting” paragraphs from their site to their other operations made correlating these fraudulent scam operations effortless. The half-assed measures pursued by these arrogant con-artists made further debunking their malicious scam network easy. 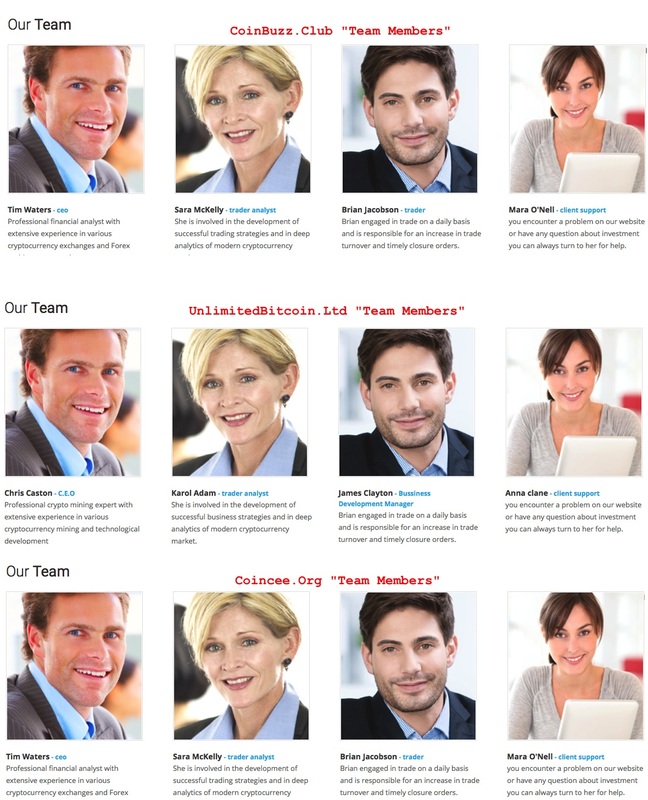 Below is an example of how these crooks used the same exact stock images and aliases along with a variation in entity titles too. Not a chance! Without question, it is unmistakable that CoinBuzz, along with all linked sites, were created with the sole intention of squeezing as many bitcoins deposits from investors as possible. Due to Bitcoin transactions being irreversible, it plays well into the deceptive and tactful marketing approach employed by this scam network. A whois.com report will reveal how coinbuzz.club was created on May 5th, 2017. Despite inhabiting the cryptocurrency realm for a duration extending 6 months, this operation is still relatively unpopular and unknown. For this reason CoinBuzz has not received much criticism for their illicit Bitcoin HYIP scheme. On top of guaranteeing returns that are beyond the realm of plausible, CoinBuzz has been linked to 10 other deceptive and fraudulent cryptocurrency related schemes. This should be a dead giveaway that CoinBuzz is not a legitimate business venture for Bitcoin investors and should be avoided by any means necessary. CoinBuzz.club is not a well-known site and possesses a global rank of 2,925,186 (as of November 14, 2017). Apparently, many of their visitors are located in Syria. According to SimilarWeb, over 38% on the site traffic derives from referrals while another 7% comes from traffic channeled through misleading YouTube and Facebook campaigns. CoinBuzz is just one infectious link out of a long chain of illegitimate Bitcoin scams. The network of scam artists responsible for these various deceptive cryptocurrency scams have shown that they possess no moral compass and will create as many phony fraudulent sites as they deem fit. Fortunately, the creators behind these mediocre sites are arrogant and lazy which makes discovering newly established and connected scams seemingly effortless. Do yourself an extraordinary courtesy by avoiding these cryptocurrency scam sites! Review Verdict: CoinBuzz is a SCAM! Do you have any knowledge or experience regarding CoinBuzz? Please share your feedback with us by leaving a comment below! If you’re looking for legitimate money making opportunities related to cryptocurrency, you might want to visit our free Cryptocurrency Investment Guide.